As a manager, mentor and career driven young professional, I have created a simple tool to facilitate the discussion of where you are vs. where would you like to be. My goal was to provide a consistent platform to converse about career planning with people inside and outside of my organization. With a simple but slick Xcelsius tool to facilitate the discussion and provide a usable career map and visualization, I’m hoping to gain traction in the local young professionals community. Once I have some good examples, I plan to build those into the dashboard as sample scenarios. Next steps will also include using either Flash variables and/or an import string to be able to share your dashboard with others. Please give the dashboard a try and let me know how it could be better! Great visual. I forgot how much of an impact primary colours give if used carefully. Only one thing that could be a usability issue – when I was playing around with edit feature, there was no indication that the data was being auto saved. I was worried that my edits will disappear. Otherwise a great too that will aid people to map their career. Man, a lot of people who use Xcelsius seem to be very creative and visual. 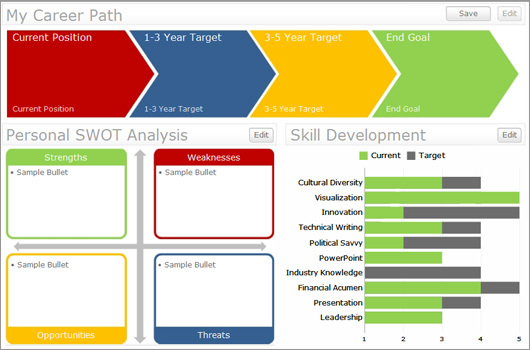 I loved just playing around with this career path dashboard, and I guess the bigger point is that it did get me to think about some of the skills I should be working on in the future. I listed “ruggedly handsome” as a strength — not sure if that counts. I agree with Rajen above about color. Having been involved with website launches, a lot goes into figuring out colors that attract a particular audience (for example, what guys like for colors vs. women). There’s a very interesting undertow to dasbhoard design. To address @Rajen’s issue, may be a Submit button at the end of the Edit popup will give it a true form look. Great feedback, thanks! I was thinking that I liked the partial transparency and that you could see things moving behind the scenes. If I were to add a submit button, would you also think that it should close the window, or allow the user to see the chart/text changes in the background and still use the ‘X’ to close? I’ve been really working on trying to pass all of the fields as flash variables so that you could share the thing with others. Even if you would have to bit.ly the link to make it more reasonable. Your posts and videos are helping me a lot to learn new things in Xcelsius. Could you plz let me knw where can i get overall videos of you with single link or in forum like that……………. Dnt think like am lazy… Hope u understand my intention………..
Hmm i can see your skill-set chart showing hike in the visualization bar. Is it Joshua? Anyway i can see a dashboard that is doing predictions. feels nice. Hi Josh, just gave your Careerpath.swf a try. Even as an career driven old professional it works simple and crisp. I have send the link to my team members for a career self-assessment. They were very enthousiastic.